I have three kids which means my household has gone through several car seats. The total is currently 9 car seats and booster seats. Between two cars and my kids outgrowing their car seats, it has been an expensive ride. Normally a mother with an almost 5 year old boy would be looking into getting a booster seat for the last phase of the car seat life span. I've never liked being normal. My son is very small for his 44" height; he finally hit 35 pounds this month. I feel safer having him ride in a 5 point harness system since he weighs so little. Plus he lacks the maturity to sit correctly in a booster seat all the time. 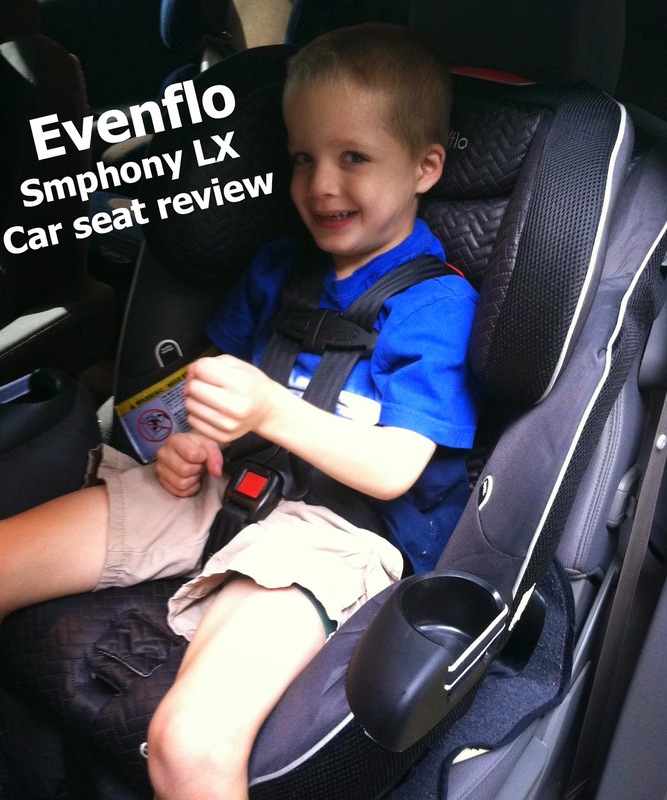 I received the EvenFlo Symphony LX to review for this post. All opinions are mine. Like all moms my number one concern when it comes to a car seat is safety. When it comes to my son I'm a little extra concerned since he has Cerebral Palsy. Thankfully, the Symphony LX has e3 Side Impact™ Protection – three layers of engineered foam designed and tested to reduce side impact forces up to 50%. That system combined with a 5 point safety harness system gives me peace of mind. I'll admit that even after 6+ years of having car seats in my car, I'm not very good at installing them. Usually there is some serious sweat and tears involved so I make my husband take care of the installation. For the sake of this review and the fact that he was out of town, I installed it myself. The Symphony LX is by far the easiest car seat I've ever installed, no tears and I chalk the sweat up to the humidity. The ease of my installation was due to the SureSafe™ System. Evenflo developed a system consisting of Quick Connector™ LATCH and Guides that increases proper installation by 2 times compared to installation with standard LATCH hooks! LATCH guides act like a tunnel, making it a cinch to find your vehicles lower anchors. The Quick Connector™ LATCH easily attaches and detaches the seat from the vehicle with one hand for easy transition between vehicles. Once I had the car seat installed all of my kids had to test it out. I love that the car seat is rated from 5-110 pounds making it safe for all of my kids to ride in it. All three of my kids said it was comfy and they liked how much higher they were sitting in the car. My son who has been riding in the car seat for about 3 weeks loves that he can see better now. You have to love kids; they pick the strangest feature to latch onto. He also likes that he has two cup holders now. The buckle pockets protect from hot buckle burns and eliminate digging under your child for lost buckles. While he hasn't mentioned this feature, it is a favorite of mine since I was always digging under his bottom to find the seat buckles. Are you ready for the best feature of this car seat as a parent? You don't have to remove the car seat to wash it! That's right no more unbuckling the seat to remove the cover to wash it. It is by far my favorite feature! I love our new Evenflo Symphony LX and I highly recommend it. It's a great car seat since your child can use it from birth until they no longer need a car seat. My son is comfortable, safe, and I won't have to buy another car seat for him since it's rated for 110 pounds. The only downfall is that my girls argue over who gets to ride in the new car seat when Mark is not with us. You can learn more about the Evenflo Symphony LX on Walmart's website. Visit Evenflo's website for a $10 or $15 off coupon.